Royal Ascot 2018 will be the best domestic flat race meeting of the year. It will also be among the hardest from which to derive a betting profit. Personally, it doesn't play to my strengths - too many unexposed 'could be anything' types - but I don't suppose that will stop me getting involved..! What does play to my strengths is to have a game plan: this is a five day meeting comprised of thirty races, so let's know what we can know about the course and any nuances or biases it may have. The above graphic illustrates the stiff test that Ascot's track presents, with the red triangle just past the winning post signifying the highest point on the course. Thus there is an uphill drag almost the whole way up the straight. On the round course, the lowest point is at the round mile (Old Mile) start, meaning that distance is also almost entirely uphill. For longer races on the round course, which is actually closer to being triangular than round, there is some early respite in the loop prior to the long climb for glory. It is also worth noting that the bend into the home straight for round course races is tight and, being situated just two and a half furlongs from the finish, can cause trouble in running with horses either locked in a pocket or having to fan very wide into the straight to find daylight. For round course races, then, it is often advantageous to be on or close to the pace: here, a horse and rider will have no traffic problems and, if the fuel has been burned proportionately, can slingshot into the straight and prove very hard to peg back. There may then be a pace bias on the round course, but what of the straight track? Races here are run at five, six, seven and eight furlongs, many of them big field handicaps or Group race sprints. The below chart shows place percentages for big field five furlong races since 2009, based on actual draw (i.e. after non-runners have been accounted for). If there is any bias, it may be slightly to high numbers; but the reality is that it is more likely where the pace lies. 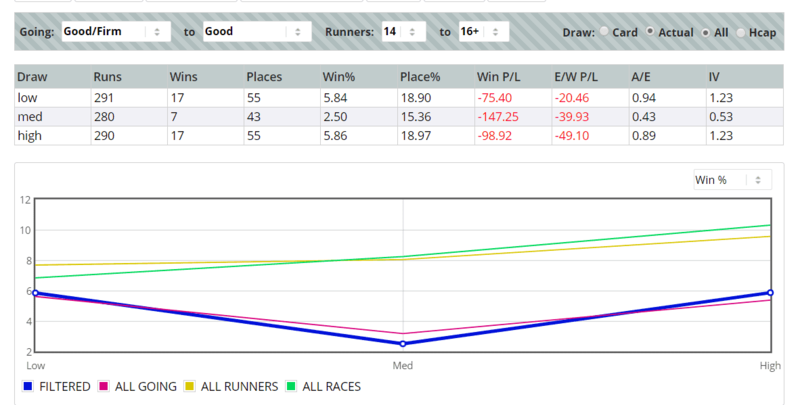 The coloured blobs tell us that horses which led (or were very close to the pace, e.g. "pressed leader") in big field fast ground five furlong races at Ascot won eight races from 76 to adopt such a run style. That's a little over 10%, and was worth a profit at starting price of £35.50 to a £1 level stake. All other run styles were loss-making with win strike rates of around half that of early leaders. That is not to say it is always easy to identify the early speed, nor that a one-in-ten hit rate will be plain sailing; but it is worth knowing that pace bias looks a little stronger than draw bias at the minimum on fast ground and in big fields. There is not a great deal in it, and this may be no more than the fact that a number of the big field races see the field congregate in the middle of the track thus conveying a 'distance travelled' advantage on those which have not had to steer themselves to that location. Front runners have the best of it again over six furlongs, as demonstrated in the below, but they are not the only favourable running style. Early leaders are more than two-and-a-half times more likely to prevail than average, with the next best group being those held up, presumably when the early gallop is a scorcher. Those racing close to the pace have managed just two victories from 142 runners. As at the minimum trip, it looks as though there could be more of an advantage to possess early speed than to be berthed in position x or y in the stalls. Low numbers have again won least often in big field fast ground races over this trip, but their place numbers are comparable to the other two thirds of the draw. But, from a pace perspective, a different story emerges. It is a long way home in a big field cavalry charge up a stiff straight seven furlongs, and those waited with have fared clear best. As can be seen, it's very difficult to lead all the way at this trip, and the midfield to back rank emerge late on to steal most of the spoils. Those help up win most often, but you'll need to know more than that to make it pay! The pastel chart lines show that, while generally higher is marginally preferred, in the context of the likely race conditions for, e.g. the Royal Hunt Cup, either flank may be favoured (blue FILTERED line). From a pace perspective, there is no dominant running style, though it is fair to say that close to - but not on - the speed has been disadvantageous. The place percentages, especially, for held up horses suggest that may be where generally to focus. As with all tracks, it is a very solid starting point to know about the constitution of the course and any general principles which may assist. Our course pages, including this one for Ascot, may help in that regard. Based on the above, we know that in spite of the stiff finish, pace pressers win twice as often as might be expected (IV) compared to those ridden further back in five and six furlong sprints. We also know that it becomes much harder to hold on to the lead at seven furlongs and a mile, and that it may be preferable to be drawn closer to one rail or other in big field straight mile races, particularly if you like a hold up type. On the round course, being handy will keep a horse out of the trouble which often manifests due to the fairly tight turn into the home straight and the relatively short run in. None of the above will help you find a winner by itself, but it may steer you generally in the right direction. Naturally, Geegeez Gold has many more tools to assist the elimination process. Good luck! Fast ground looks likely to persist, through the week, as there’s no rain due after a shower tomorrow. The straight course will be very fast (as will the last three furlongs of the round course obvs) unless it is over watered. I suspect those drawn high will be the beneficiaries. race 1 the mile is that run over the round course or straight track?